Médoc or St. Emilion? With 3 days in Bordeaux, we had the luxury of time to do both. But what if you only have time for a single day trip from Bordeaux? Should you spend the day tasting Bordeaux wine in Médoc or exploring the UNESCO heritage village of St. Emilion. 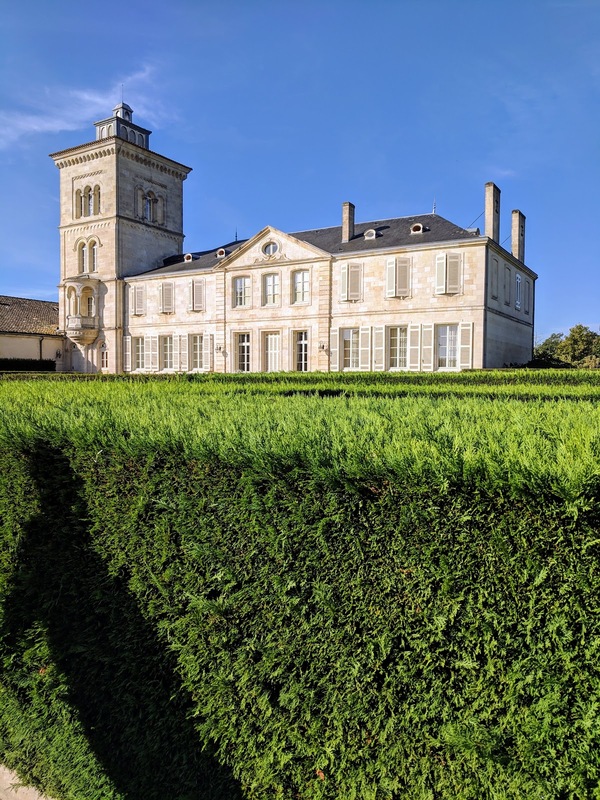 Read on to learn more about our experience visiting Médoc and St. Emilion so you can decide for yourself which way to go. It's only in the last decade or so that Bordeaux wineries have opened up their doors to the public. It takes about an hour by car to go from Bordeaux to Médoc. The Médoc wine region is not well served by public transportation so your best option is to take an organized tour. We booked a full day tour of 1855 classified châteaux of Médoc through the Winerist. Our wine tour of Médoc was not cheap at 115 EUR per person at the time of writing. 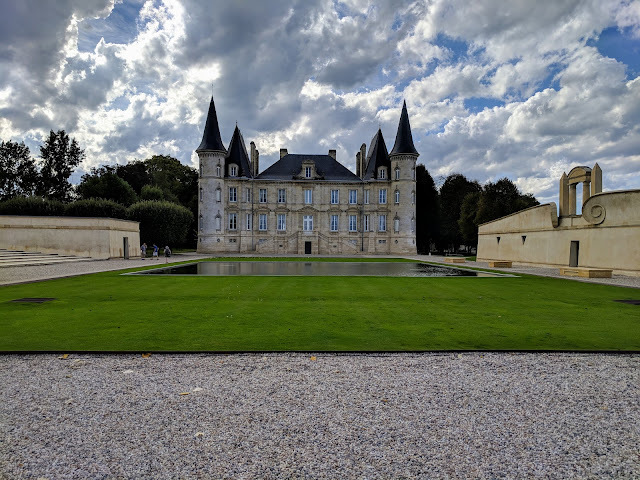 The day trip from Bordeaux included 3 wine tasting experiences at renowned châteaux plus van transportation and a guide. We spent the day with about 8 other wine enthusiasts touring Médoc AOC (appellation d'origine contrôlée) in the Bordeaux Wine Region. What sub-regions are included in Médoc AOC? Translating from a map to 'real life', each Médoc sub-region is a small town or village featuring a number of châteaux. We have always found the labels on French wines to be quite confusing. We learned one very important tip on our Médoc wine tasting tour. The highest quality wine from any château is named after that château. All the other wines have different and often more creative names. The second or third wines from a given château are also very good but often don't need to be aged as long as a first quality wine. Wine making in Bordeaux has a rich tradition and has been regulated for over a century. In 1855, Napoleon III undertook a classification of the best wines in Bordeaux across five levels or crus. The Bordeaux Wine Official Classification of 1855 even today determines a wine's quality and often the price and there have been very few changes in the ratings since 1855. 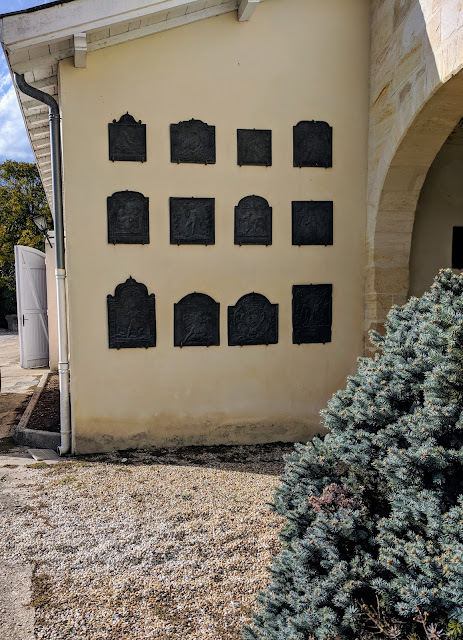 We started our day trip from Bordeaux at Château Lagrange ranked with the third growths (troisièmes crus) in the 1855 classification. Visit Médoc not just for the wines but for the amazing photo opportunities. We were taken for a walk around the grounds and then down into the cellar. We learned that while Lagrange has a rich history, the château is now owned by Suntory, a Japanese liquor distributor. 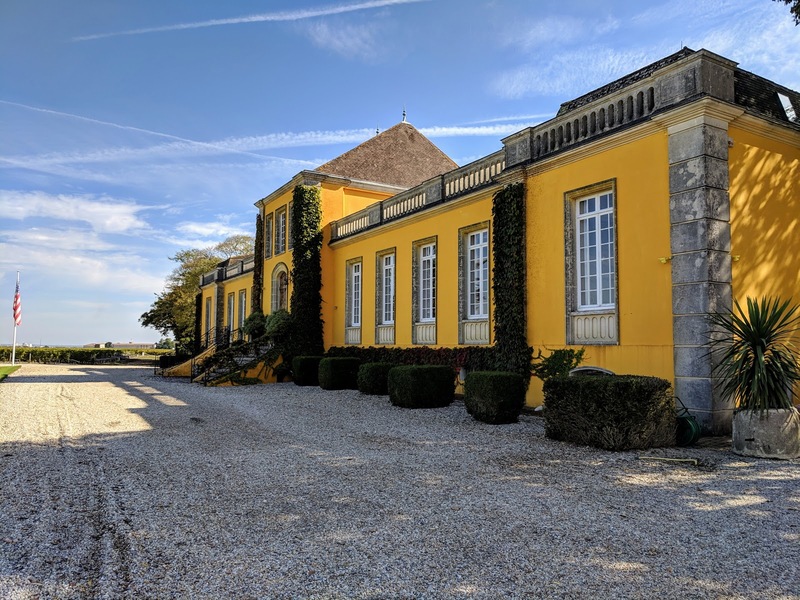 Médoc is mainly known for red wines but Château Lagrange has started to bring white Bordeaux wines to market to align with the palates of the Japanese market. 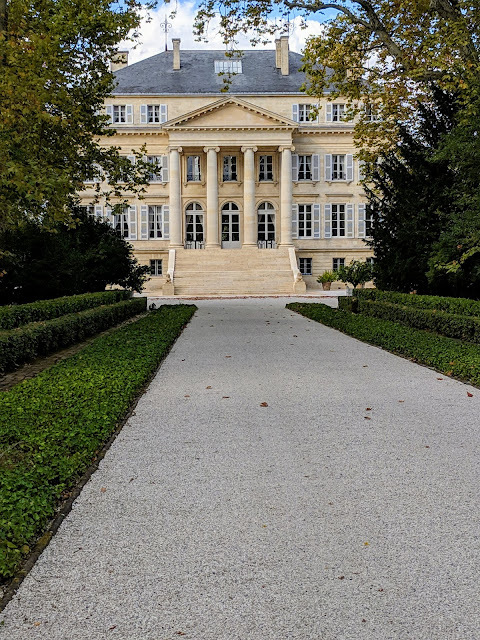 Our next stop was in Pauillac where we had an hour and a half for lunch. There are a number of restaurants spilling out onto the sidewalk overlooking the Gironde River. We sampled a 3 course menu of the day at Le Saint Martin along with a carafe of Bordeaux wine (of course!). Highlights included a country pate, a salad with baked brie and an ile flottante for dessert. Our first stop of the afternoon was at Château Lafon-Rochet, a quatrièmes crus (fourth growth classified producer) in St.-Estèphe. We got the obligatory tour of the grounds and wine-making process. 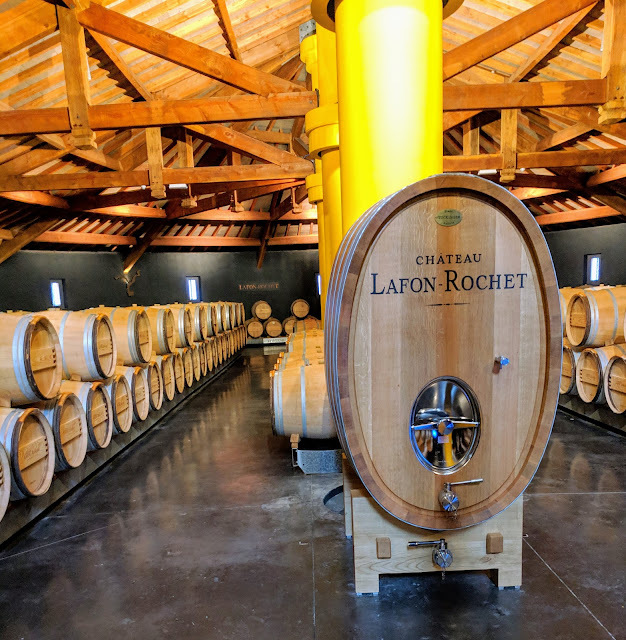 We visited Bordeaux in early October and were just in time to catch the tail end of the harvest at Château Lafon-Rochet. 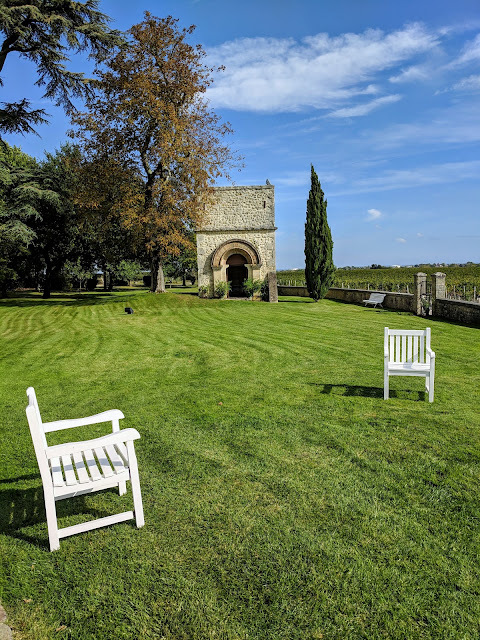 Château Lafon-Rochet features a small historic chapel and large green space overlooking the rolling vines. Not a bad place to sip and savor some of Bordeaux's finest wines. Our final tasting stop of the day was at Château Prieuré Lichine, another quatrième cru. The grounds of Château Prieuré Lichine were truly lovely and featured ivy climbing the walls of the château burning in bright Autumn colors. A variety of heavy metal plates were displayed on the walls from antique stoves and added to the charm and history of the place. 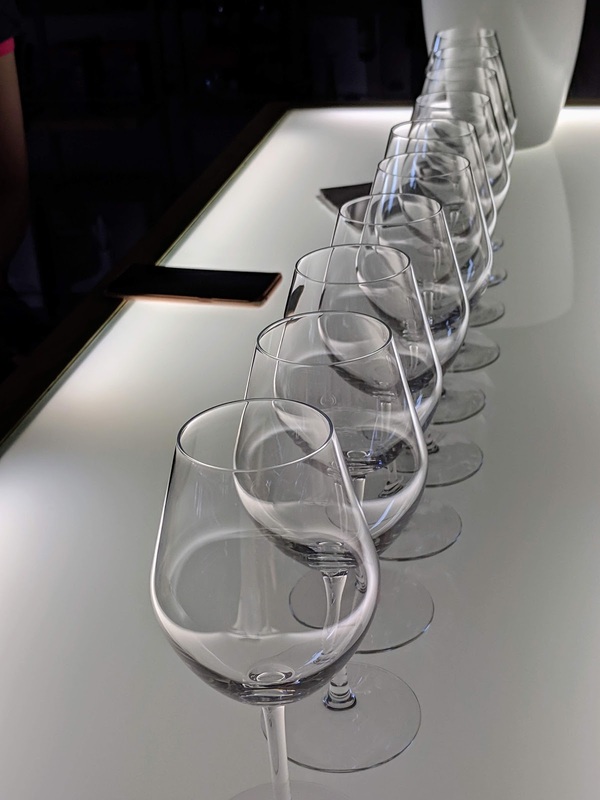 We concluded our tour with tastes of three Bordeaux wines in a modern tasting room. The Bordeaux Wine Official Classification of 1855 is no joke and determines the price points and exclusivity of various wine producers in Médoc. 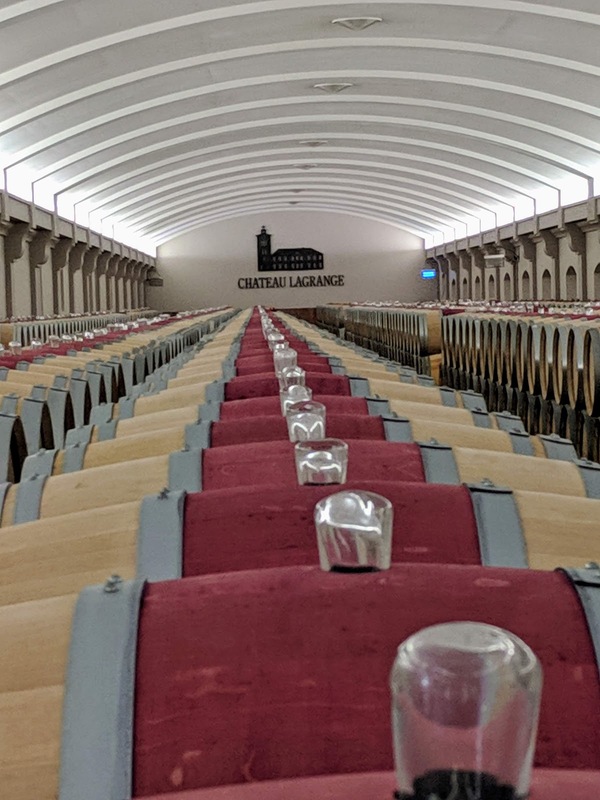 Our Bordeaux wine tour included tasting experiences at troisièmes and quatrièmes crus. We had to satisfy ourselves with photo ops at premiers crus (first producers) like Château Lafite Rothschild. The opulence of the châteaux seemed to increase in proportion with their rating in the 1855 classification. We were lucky enough to be able to pull into the parking lot and poke our cameras through the fence at Château Margaux (another premier cru). Our tour guide lives in Margaux and happened to know the security guard. Even deuxièmes crus were quite impressive. We stopped to photograph Château Cos d'Estournel which had sadly suffered from a recent fire. Choose Médoc for your day trip from Bordeaux if you want to learn more about Bordeaux wine including samples of the good stuff in an organized tour. 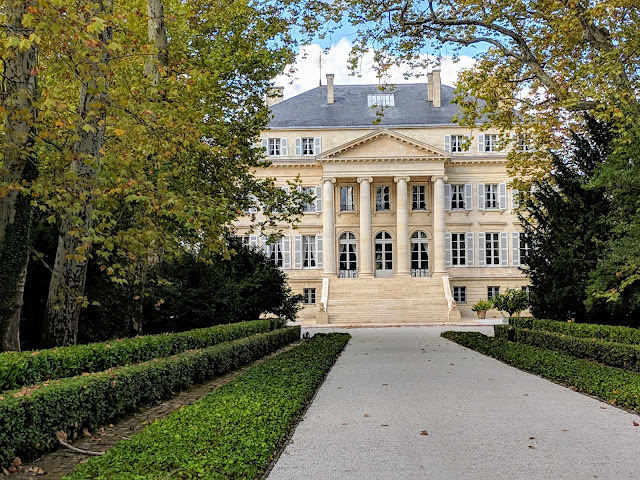 Take the opportunity to get a close-up look at some of the premier châteaux in the Bordeaux Region. The Bordeaux to St. Emilion route is well served by public transportation and a round trip ticket costs less than 20 EUR. St. Emilion is located about an hour from Bordeaux by train and is an easy day trip by rail. Read on to find out what to do in St. Emilion and why you should choose this UNESCO heritage village for a day trip from Bordeaux. The St. Emilion train station is located about 20 minutes on foot from St. Emilion village. 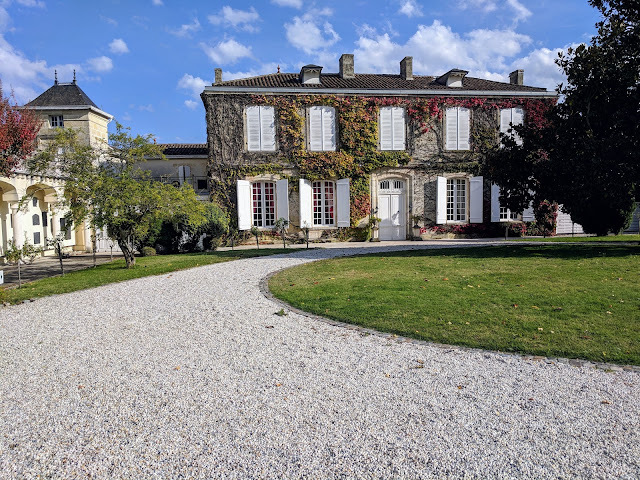 Take the opportunity to marvel at the châteaux on the hillside and the rolling vineyards in every direction. Such an idyllic landscape. 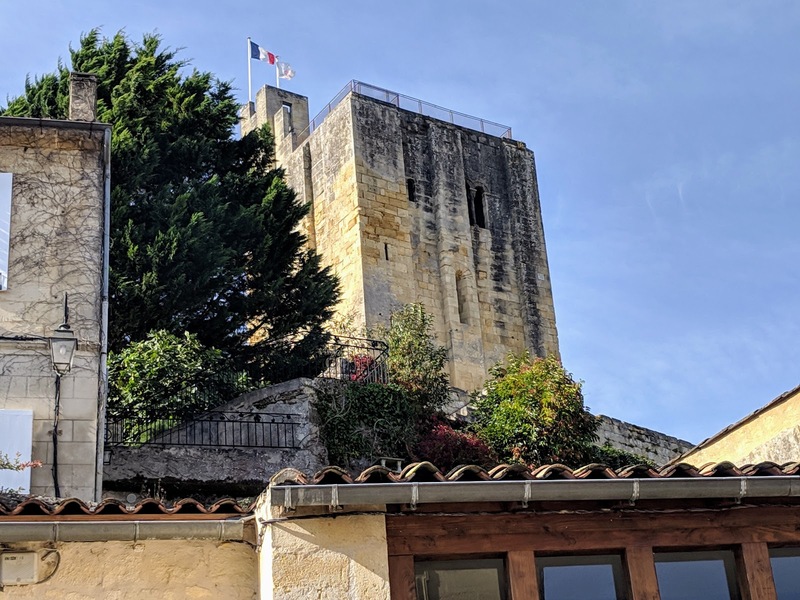 Upon arrival in the village of St. Emilion, make your way uphill to enjoy the views from towering Château du Roy. The views from the base of the tower are stunning in and of themselves but for just a few euro, you can buy a ticket to climb the tower for even better views over UNESCO heritage certified St. Emilion. 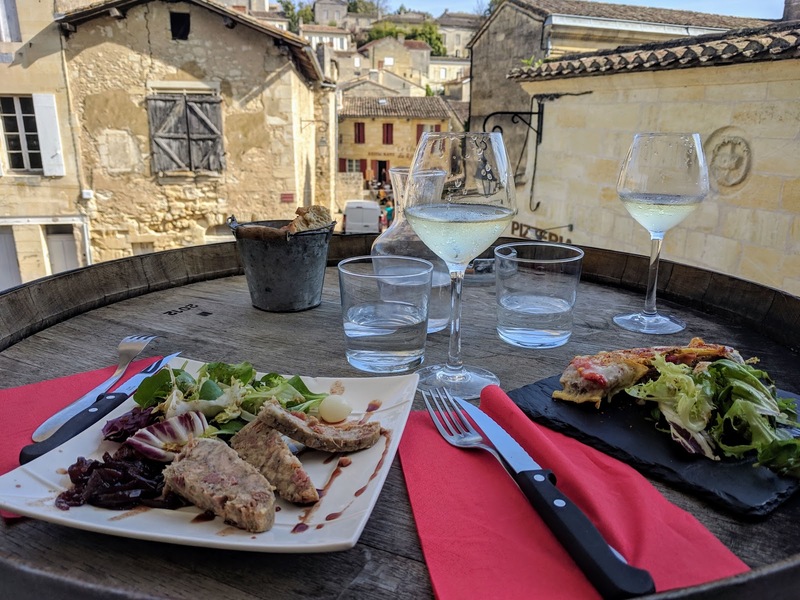 You'll certainly find great food in St. Emilion. 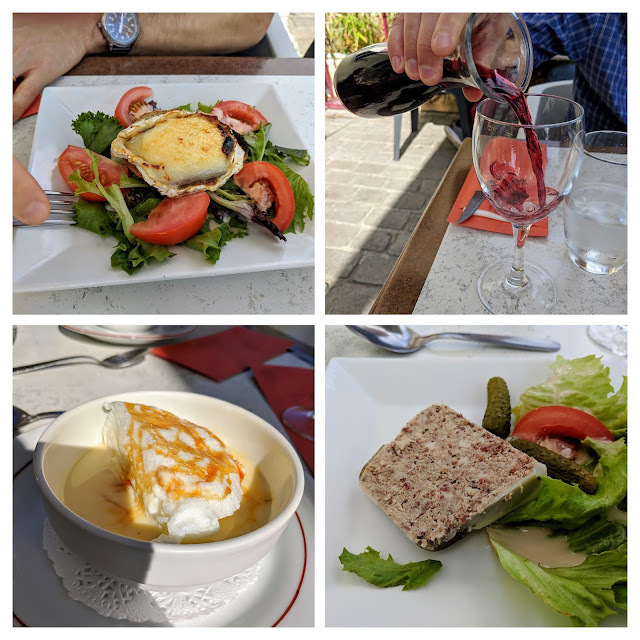 We ate on the terrace at L'Antre Deux Verres soaking in the sun over a two course lunch with a glass of white Bordeaux wine. St. Emilion features narrow, cobbled streets that almost cling to the hillside. Spend some time getting lost and browsing the shops of this classic Bordeaux wine village. St. Emilion even has its own style of macaron. Seek out Macarons de St. Emilion. 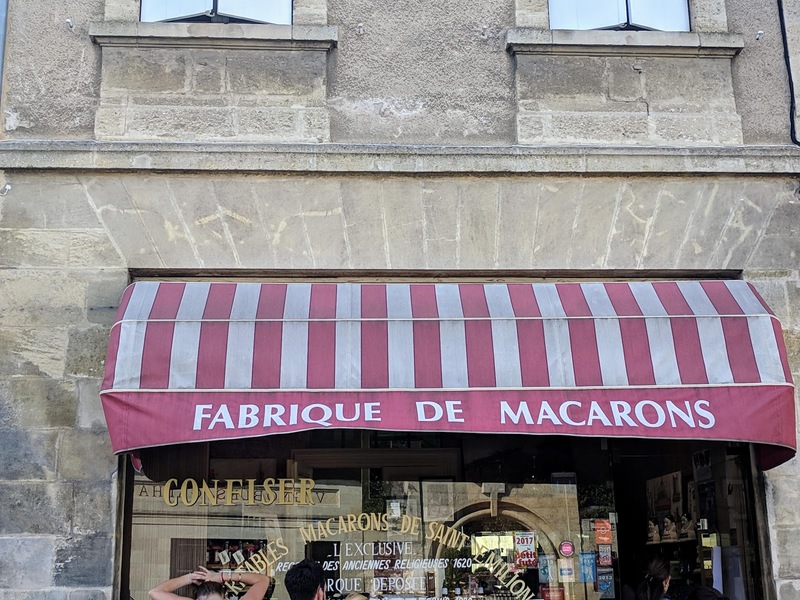 Look for a red-striped awning advertising Fabrique de Macarons. 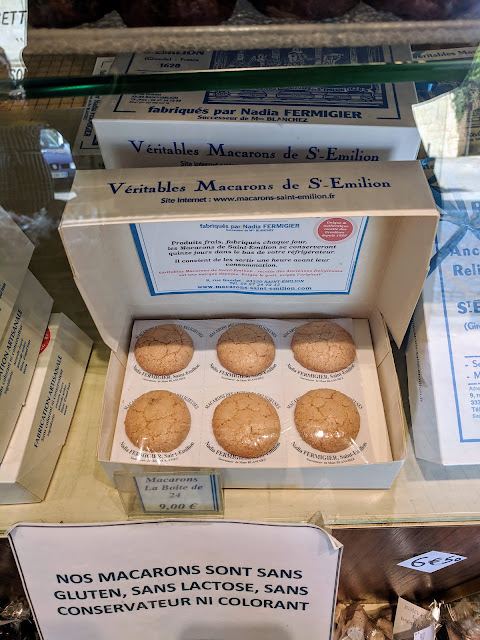 Macarons de St. Emilion are served in boxes with the cookies baked onto thin sheets of cardboard. Macarons de St. Emilion are soft and delicate with a hint of coconut flavor. 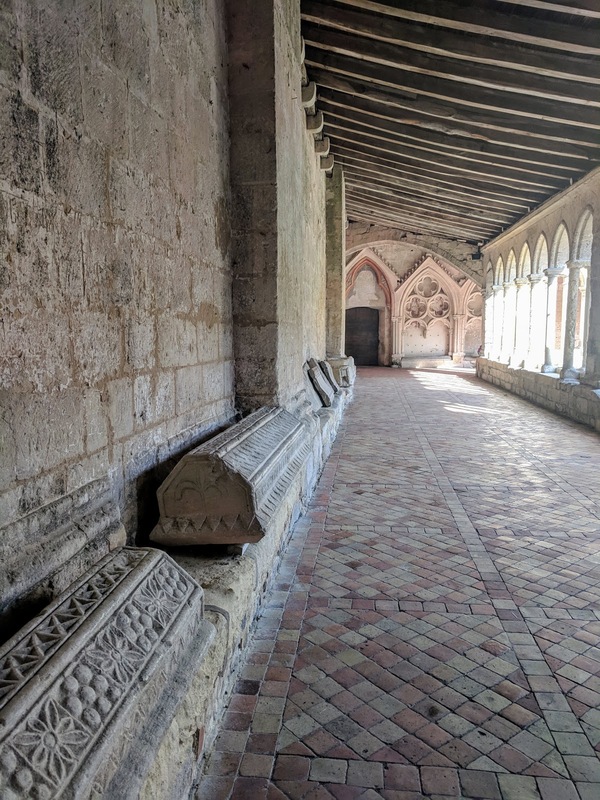 Take some time to explore inside Eglise Collégiale including the interior courtyard. Built in the 12th century, the church simply oozes with history. 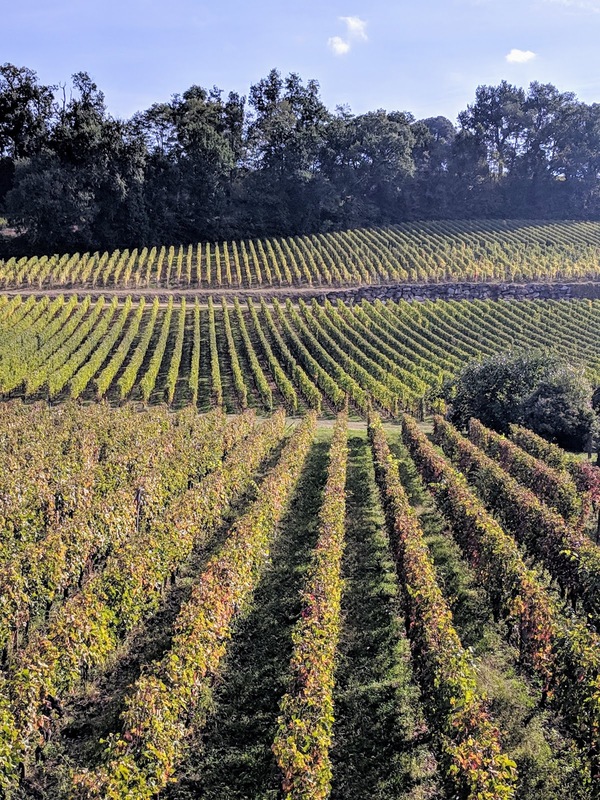 At the edge of St. Emilion, you'll discover a series of wineries. We popped into Clos des Manuts. 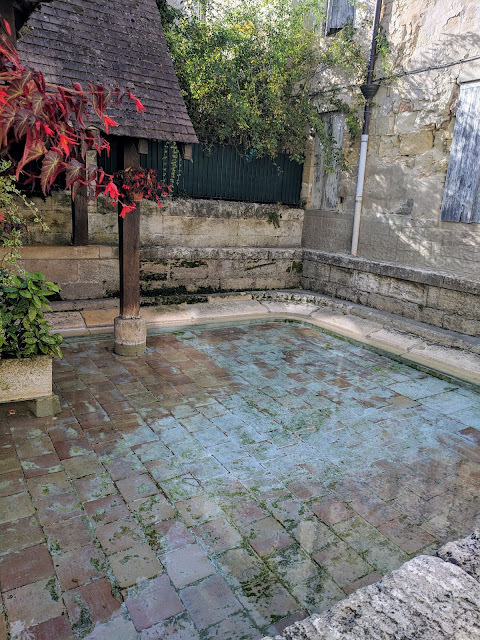 We visited St. Emilion on a hot day in October and welcomed the opportunity to descend into the cool cellars for a self-guided tour. 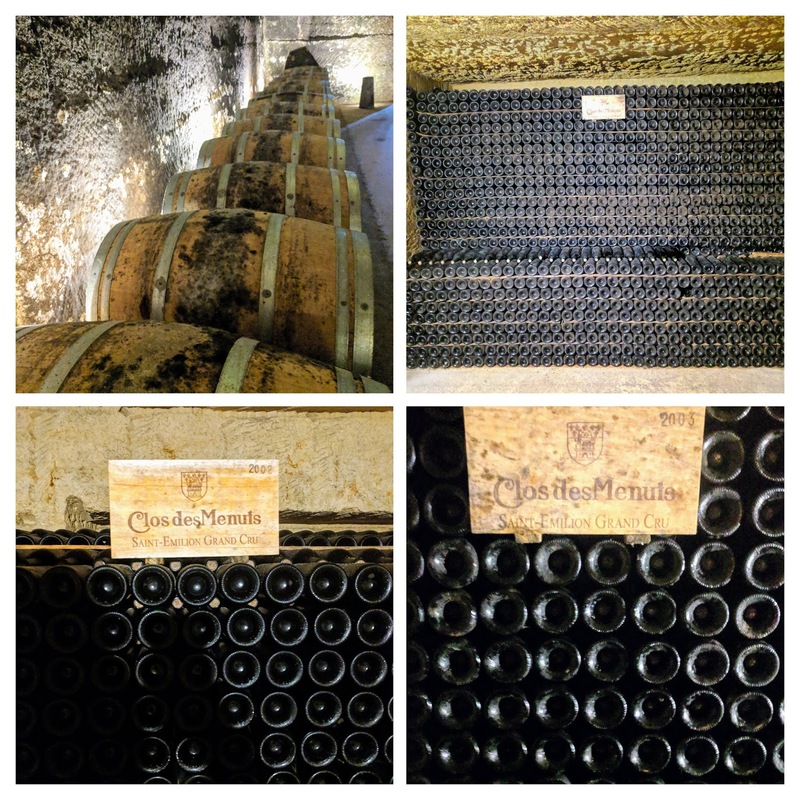 Clos des Manuts featured thousands of bottles and barrels. Once more, we felt as if we'd stepped back in time when we went below ground. Another factor contributing to St. Emilion's ambiance are the fountains. 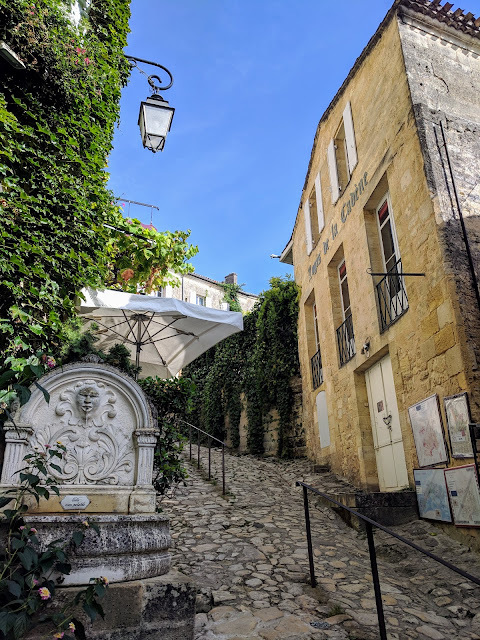 Keep an eye out for the petite and grande fontaine as you explore the streets and imagine the local inhabitants visiting to get their water and a bit of local gossip throughout the centuries. 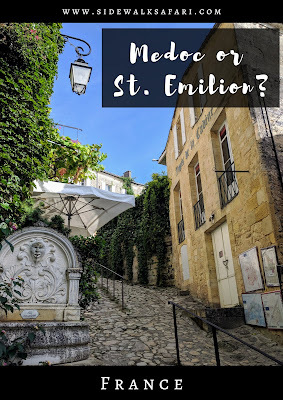 Choose St. Emilion for your day trip from Bordeaux if you are on a budget. The round trip train ticket from Bordeaux to St. Emilion costs less than 20 EUR. St. Emilion is also a good choice if you are short on time. A full day is required for a Médoc wine tour but you can safely visit St. Emilion in half a day. St. Emilion is also a good choice if you are interested in the deeper history of the region. Depending on your interests, Médoc or St. Emilion may be the better choice for a day trip from Bordeaux. Médoc vs St. Emilion? Here are my picks on a number of different dimensions. Choose Médoc is you are not budget constrained and mainly interested in wine tasting. Choose St. Emilion if you are short on time with a wider range of interests. If you can squeeze in both like we did, I definitely recommend Médoc and St. Emilion as day trips from Bordeaux. 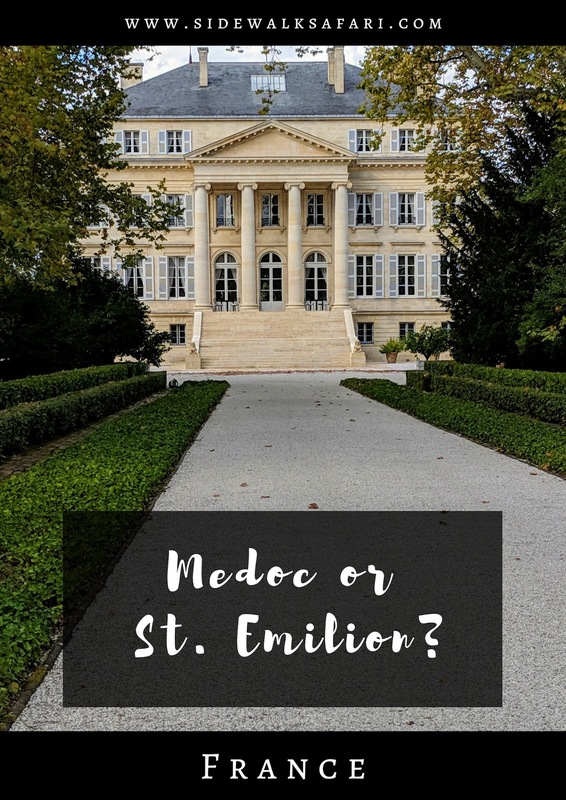 Medoc or St. Emilion? 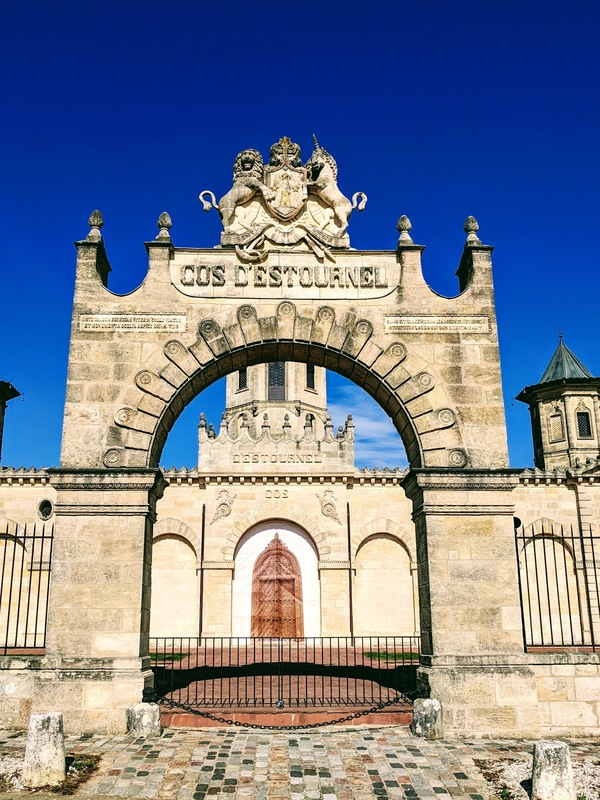 There are so many excellent places to visit and taste wine in the Bordeaux region of France. Find out the pros and cons of wine tasting in Medoc. 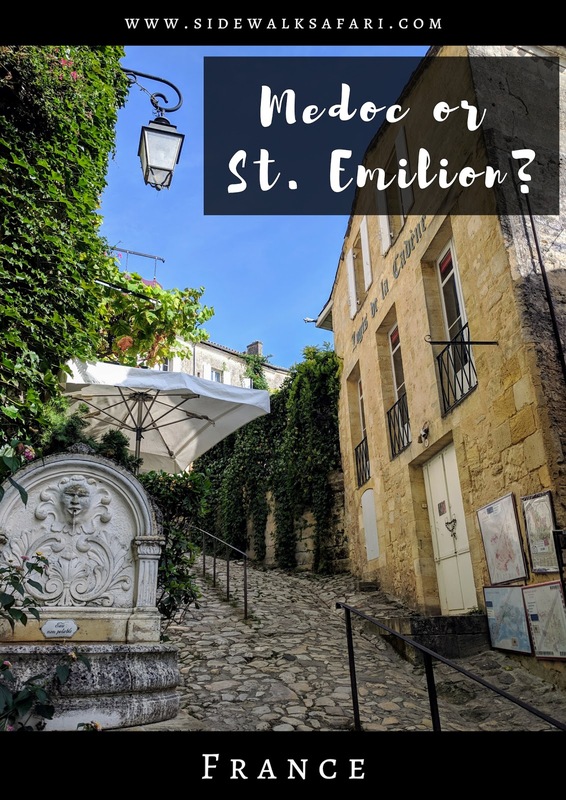 Learn about what to do in St. Emilion.